Imo State government has come under fire in recent times due to the state’s urban renewal programme which has triggered widespread demolitions, forced evictions and displacement across the entire state. Major markets, private residential and commercial buildings, public spaces and buildings, historical sites have all been demolished with scant evidence of compliance with due process, consultation and compensation for the affected populations, resulting in numerous properties and lives lost in the process. Still fresh in the minds of Imo citizens is the gruesome death of 10-year-old Somtochukwu Ibeanusi hit by a stray bullet during a demolition exercise at Eke-Ukwu Owerri Main Market. In light of these, Imo urban renewal programme has not only generated moans from the bereaved and displaced, but also queries on the legality of government’s actions. Determined to influence a shift in the approach and direction of the urban renewal programme, S4C conducted a one-day capacity-building workshop that brought together 53 directors, heads of departments and permanent secretaries of 9 government ministries involved in improving systems for urban planning, basic service delivery and metropolitan governance in the state. 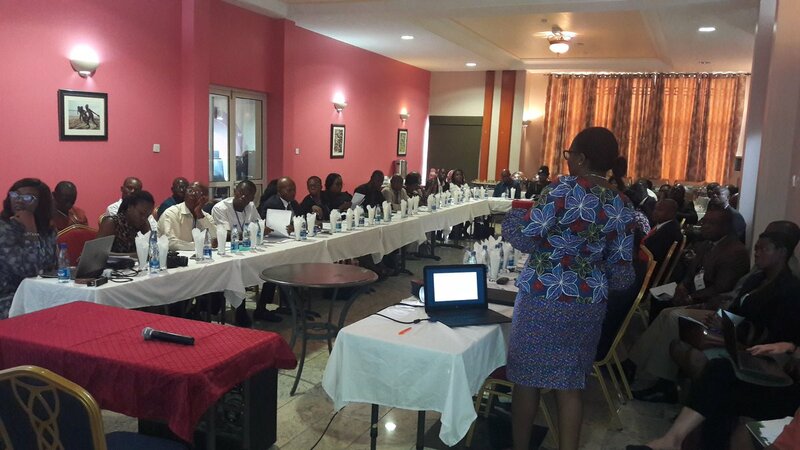 The May 31, 2018 workshop held in Owerri, Imo State capital, aimed at helping city planners and policymakers gain a better understanding of sustainable city improvement processes and inclusive urban development programmes, and in the process, strengthen the institutional and human capacities critical for the emergence of cities that are viable,inclusive and sustainable. The workshop’s presentations were divided into four sub-themes, with each part addressing specific challenges associated with the urban renewal programme in the state. Four urban experts delivered the presentations and led the discussion around each sub-theme. The first presentation, ‘Social Equality and Urban Inclusion’ , by Dr. Taibat Lawanson, an associate professor of the Department of Urban and Regional Planning, University of Lagos, shed light on the roles and responsibilities of urban development professionals. She described urban and sustainable development as the regeneration of urban cities in order to plan for growth and provide the necessary infrastructure a growing population needs. In this regard, the right to the city framework presents a paradigm that urban planners need to consider and adopt. A World Charter for the Right to the City adopted at the United Nations Conference on Housing and Sustainable Development (Habitat III) in Ecuador, 2016, emphasized the rights of all people to live in dignity in urban areas. Furthermore, urban planners need to frame urban development plans as a social justice agenda where everyone gets the support they need. Framing urban development as a social justice agenda requires planners to incorporate social equality, equity and justice in their urban renewal processes. It also requires planners to clarify processes by identifying the methodology, reasons and consequences of their plans on the people. For instance, destroying a local market and replacing it with luxury shopping complexes that traders cannot afford may not help to realize the state’s objective of boosting economic vibrancy and attracting investors. An example is the Lagos-Tejuosho Market which the state government demolished and rebuilt after an inferno destroyed the market, but fixed new shop letting rates traders could not afford. The consequence is that Tejuosho now wears a more beautiful look with less commercial activities going on there. What is a better approach? This is an important question to first engage in any urban renewal plan. A qualitative regeneration programme would see policymakers and implementers take into consideration the socio-economic needs and realities of the rich, the poor and low income groups of the society, enabling them all to prosper, to live decent lives, to enjoy city opportunities and to access their human rights equally. The right to city inclusion has to be resolved by cooperation and co-production as in the model case of ‘Warwick Junction Urban Renewal Project in Durban, South Africa’ where a committee facilitated a negotiation between the traders and project implementers, and a common goal reached on how to properly manage the unsanitary refuse disposal system that had plagued the market junction. Borrowing a leaf from this, Imo planners can adopt a developmental agenda that prioritizes inclusiveness, citizen’ welfare, infrastructural development, decentralization of governance by empowering local governments and communities while retaining a flexible, dynamic and responsive planning structure that would inspire a sense of connection between people. The second presentation, ‘Managing Informality and Urban Sprawl’, by Barbara Summers of CMAP (a Community Mapping Advocacy Group based in Port-Harcourt, Rivers State) used images and videos to visualize the intensity of informality in urban spaces. As urban populations spiral at an increasing rate, more and more people relocate into unplanned settlements across high-risk urban areas. The resulting informality is a core urban condition in Nigeria with many people living in urban slums close to vulnerable coastal areas and borderlines that lack basic infrastructure. Quite often, governments and city planners respond to the spread of informality through demolitions, restraining orders, fierce land disputes, protracted court actions, and marginalization. 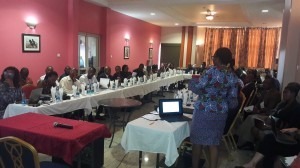 Examples abound in Lagos, Port Harcourt and of course, Owerri, Imo State capital. Informal settlements can be managed and growth achieved by carrying out an area-based development plan which accommodates an inclusive structure for addressing a range of issues prevalent in informal settlements such as the the reuse of space, phased clean up, service provision, designing for people’ needs, improvement of security, provision of electricity and so forth. Dr. Muyiwa Agunbiade, an expert in urban and town planning delivered the third presentation, ‘Governance Systems: Openness and Participation’. He explained how qualitative governance systems enable open relationships between the people and the government. The key components of the framework of good governance are capacity, inclusiveness, contestation and accountability. These components provide citizens a democratic platform to make their contributions in decision-making, consultation processes and public debates on urban planning. The government must also seek a multi-level approach to governance through inter-agency interactions, collaborations and responsibilities to foster good governance systems in urban renewal programme. Therefore, what Imo city planners need to do is to incorporate certain elements into the state’s renewal programme: Those elements include planning, public hearing, relocation and infusion of technology to allow participation by different stakeholders. The last sub-theme on ‘Strong Legal Foundations: Policies, Programs and Plans’, by Victoria Ohaeri, the Executive Director of SPACES FOR CHANGE, extensively dwelt on the importance of anchoring urban renewal programmes on strong legal foundations. Legal foundations presuppose the centrality of the law in urban regeneration plans. Urban renewal often involves the acquisition, clearance, and rebuilding of blighted areas, with implication on private rights. Legal foundations are necessary for resolving conflicts that might arise as a result of invasion for developmental purposes. Law can set the conditions under which public & private development and redevelopment can occur (zoning, districts) and also sets limits on the behavioural pattern of the state and non-state actors during that process. For the state to have a strong legal foundation, it must make a determination of its financial and legislative capacity. That is: the state must have the resources and an independent legislature with the capacity to translate its urban policies, programs and plans into enforceable instruments. The state also needs to allocate responsibilities/powers/resources across its ministries, departments and agencies (MDAs) in different levels of government. Doing means requires planners to set clear objectives, targets, responsible institutions, scope of ministerial powers, implementation and monitoring mechanisms. The roles and responsibilities of different stakeholders need to be clarified in the rule books to ensure that all have distinct functions, and mechanisms for implementation. Consequences for ministerial or regulatory overreach must be spelt out. Inter-ministerial coordination is also important. Rule books must clarify points of intersection and how to infuse harmony (requirement for inter-ministerial briefings to update and avoid duplicity). The four presentations provoked fierce debates and discussions around community engagement strategies, project delivery timelines and managing tension-prone relationships between political leaders and policy implementers. ‘There will be hindrances if the voices of the people are not heard’ Mr Simeon Erhakpotobor, Public Relations Officer of the Communities’ Alliance against Displacement (CAD) said. The Permanent Secretary of the Ministry of Gender and Women Affairs, Mrs. Nwaiwu, brought to the notice of participants that, a comprehensive bill for an Owerri town and regional planning law would soon be passed. She further stressed that women and children should always be considered in urban development initiatives and leaders must realize the essence of feasibility studies. A director of the Bureau of Lands, Imo State wanted to know how urban inclusivity can be harnessed while while another participant advised that urban planning should not be elitist in implementation else the progress and development of the State would be compromised. At the close of the workshop, participants expressed their appreciation to SPACES FOR CHANGE for convening the first-ever capacity-building workshop for city planners in Imo State. The Permanent Secretary of the State’s Ministry of Land thanked the organization for demonstrating an unwavering commitment toward helping the government to carry out sustainable development plans that protect citizen’ interests. SPACES FOR CHANGE | S4C proceeds upon the premise that building the capacity of officials and stakeholders that have a role in city planning and urban development is necessary to enable them walk the reform process, embrace best practices and innovative approaches that have worked in other successful initiatives; and also take advantage of the facilities set up by the state government to facilitate the emergence of cities that are viable, inclusive and sustainable. It is within this context of supporting the ongoing urban reforms that this workshop is crafted.